Is your business using HubSpot's Lead Scoring tool to help your sales reps focus on the best leads? Is your marketing team qualifying leads in an efficient way as they come through the digital door? Were you even aware that HubSpot has these capabilities? Lead scoring is sometimes overlooked by marketing strategists who just don't have the time or expertise to fully leverage this type of process. And despite all that lead scoring has to offer, a whopping 79% of B2B marketers have not yet established their strategy! HubSpot's lead scoring components may be intuitive, but coming up with a fool-proof lead scoring strategy is NOT. This comprehensive guide sets out to explain what lead scoring is, why it matters, and how to seamlessly plan, map and execute it from start to finish. Let's turn you into a lead scoring pro, shall we? 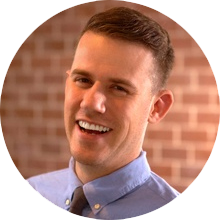 But if you really want to break it down into layman’s lingo, lead scoring is simply a more automated way to qualify leads based on who they are and how they engage with your brand. Since first becoming “a thing”, lead scoring has played a substantial role in helping companies to prioritize and qualify the best leads for sales teams to pursue. To accomplish this, lead scoring processes make use of a point system through which point values are assigned to key sets of criteria, properties and behavioral actions associated with a contact in a company’sCRM system. Points accrue over time (or they’re subtracted), and the sum of these points is called the lead score. Note: for those of us who are using HubSpot’s marketing automation platform, this total point value is referred to as the HubSpot Score in a lead’s contact record. Top performers are finding that lead scoring truly has an impact on the business overall. But these are just stats pulled from the digital universe. When you practically think about how the lead scoring process benefits a company, there are several key reasons it’s worth implementing. 1. Lead scoring helps identify your ideal buyers. Is the lead a good fit? Does the lead exemplify qualities of an ideal prospect with whom you’d like to do business? In other words, is the information you’ve collected about the lead aligned with criteria you’ve established for your target buyer personas? Is the lead interested? Has this person demonstrated behavior that indicates your content, products, or services appeal to them? As a marketer or salesperson, it’s important to capitalize on engaged prospects who are showing they’re interested in buyin’ what you’re sellin’ – by following up with relevant content as soon as possible. Optimally, lead scoring will enable you to pinpoint prospects that demonstrate a ‘yes’ to both questions – a mutual good fit! And when you use the HubSpot Lead Scoring tool, it’s a heck of a lot easier to determine the answers. 2. Lead scoring supports your marketing automation efforts. When you adopt a lead scoring strategy, you are implementing a system that defines marketing qualified leads (MQLs) and sales qualified leads (SQLs) in a quantitative manner. This is important because it makes lead quality tangible and measurable – not only helping marketers with reporting hard numbers to the C-Suite, but also providing an easier way for them to calculate ROI. For example, marketers have a window into which sources are producing X number of high-scoring marketing qualified leads on a weekly basis. Lead scoring not only enables a business to automatically assign these types of contact “lifecycle stages” through a workflow, it also affords marketers the opportunity to enter leads into specific nurturing campaigns based on their lifecycle stages in order to deliver tailored content to them. For instance, you might set up a personalized sequence of emails for a marketing qualified lead, or you could hand pick a couple relevant case studies from a sales kit to deliver to a sales qualified lead. Either way, a solid scoring process makes it significantly quicker and easier to assess where leads are in the buying cycle, what they’re interested in, and how best to continue a meaningful conversation that keeps the momentum going. 3. Lead scoring strengthens the relationship between Sales and Marketing. Perhaps most importantly, lead scoring offers Sales and Marketing a way to jointly come up with a definition for what MQL and SQL mean for their company. If these two departments have a documented mutual understanding of these lifecycle stages, both parties are held more accountable, and in turn, are less likely to complain that the other isn’t doing its job (which, to this day, is a gap many companies have yet to bridge). However, if there does happen to be a lead delivery or follow-up issue expressed from either side, the two teams can meet to work on redefining the process together. When there is no process in place, it’s anybody’s guess as to whether or not Marketing is delivering enough SQLs or Sales is effectively working the opportunities they’re given. Lead scoring also increases the effectiveness of marketing and sales efforts by giving them the same point of reference when discussing both the quality and quantity of leads. Think of it this way: the shared terminology and real-time data comprise a common lead scoring language! Alright, it’s time to get to the real meat of this post: how to plan, map and set up your Manual Lead Scoring process in HubSpot. ***Any HubSpot customer who has HubSpot Professional or Enterprise will be able to access this tool. *** To do so, click on the Contacts tab and click on Lead Scoring; your default view should be the Manual Lead Scoring tool. If you're using the new HubSpot navigation, click on Settings > Marketing > Lead Scoring and you'll arrive in the same place. Here, I’ve broken the process into 5 steps, some requiring a lot more time than others, but 5 steps nonetheless. Okay, let's make you a lead scoring pro! Step #1: Establish a set of baseline criteria. First things first, Marketing (and ideally, someone from the sales team) needs to sit down and come up with some preliminary lead scoring criteria from which to build your process. You’ll be giving consideration to two types of data: explicit data, which is created from information collected via an online form (job title, industry, etc. ), and implicit data, created from various actions taken by a lead from which you can draw inferences about engagement, interest and buying intent (page views, email opens, CTA clicks, etc.). Each criterion from each set of data can have a positive or negative impact on the lead’s score, depending on the way your contact properties are set up, as well as your business's goals and needs. Let’s go down the list of what data could be involved in this initial criteria. Which of your leads’ HubSpot contact properties found in their contact records are most important from a sales perspective? First, identify which properties you’ve used to help crystallize the definitions of your buyer personas. Then consider which additional custom properties you’ve created that will help you make more informed decisions about lead quality. For instance, you may want to award a contact whose “Job Title” value indicates they have purchase decision-making power or influence. Similarly, you could also rank the options a contact can self-select in the “Industry” drop-down form field in order of importance – with your target industries receiving more points. Building on the idea of ranking, it’s important to remember that some contact properties may yield positively and negatively scored responses, depending on the information a lead provides in a form field. “Number of Employees” or “Annual Revenue” are prime examples. Perhaps your company only works with organizations of a certain size. A contact who answers on one end of this spectrum could receive points while another might have points deducted. Rest assured this is all doable in the Lead Scoring tool. A word to the wise: There may also be values in specific form fields—or entire fields for that matter—that remain neutral; there is no need to assign a value to every single contact property in your HubSpot portal. What you should do, however, is use (or create) form fields that offer pre-populated options to a lead: drop-down menus, check boxes, radio select fields, and so on. Your ability to score leads, as well as segment them for email campaigns, based on contact property values will be dramatically hindered if contacts are typing in their own custom responses into single-line text fields on your forms. Next, export a list of all the forms you have on your website. Rate the value of each individual form’s respective offer in terms of the buyer’s journey – either on a 1-10 scale or using terms like low, medium and high. High-value forms would be contact forms and demo, assessment, or pricing requests, medium-value forms might be webinar registrations or technical guides, and low-value forms might include checklists or introductory white papers geared towards prospects at the top of your sales funnel. In most cases, it’s obvious to your team which forms are better indicators of sales readiness than others. So use your best judgment! A word to the wise: Lead scoring is one reason why having a different form for each landing page or contact module on your site makes your marketing life so much easier. For those of you who have used the same lead gen form across multiple pages, you’ll have to specify the associated page in the Lead Scoring tool. It’s not that difficult, but its an extra step that could otherwise be avoided. Moving forward, using a unique form in each area of your website is recommended (for several other reasons we won't get into here, too). When brainstorming your lead scoring criteria, give some thought to which website pages you think are the most important. Of course, this is partially common sense. If someone is looking at a pricing or demo page, they are likely farther down the funnel – and those pages should be worth more points. But there are other pages, like case studies and customer stories, a portfolio of work, or industry-specific pages that shouldn’t be left out of the scoring process. A word to the wise: If you have the data available to you in your CRM, take a look at the timelines from the HubSpot contact records corresponding with your top customers – or at least those who converted as a result of your inbound marketing efforts. Do you notice any trends? Which pages did your customers view before the deal was sealed? Are there any pages or posts that have popped up in sales conversations? Give this site content a little lead scoring weight, as well. With respect to HubSpot’s contact property “Original Source Type,” take a moment to figure out which channels have historically performed the best for your business. Which sources have consistently delivered the most qualified leads over time? If there is a clear pattern, you know where to allocate those points. If the data is relatively inconclusive, the source “Direct Traffic” typically indicates that the potential buyer specifically is searching for YOUR company by typing in the URL, which is enough reason to award these contacts a couple more points. A word to the wise: If you have some strong referral websites working in your favor, you can also specify which ones should receive points. For example, Precision Marketing Group receives a fair amount of referrals from our HubSpot Agency Partner listing, and many of those referrals have become sales opportunities and customers. Therefore, any lead coming from a URL containing that site is awarded a good amount of points in our own lead scoring system. If your business partners with another company, or has a listing on a popular industry website, rate those referrals accordingly. Engagement ties into examining the implicit behavioral data you’ve collected about a contact. When coming up with engagement-based lead scoring criteria, it’s best to include as much you can: email opens and clicks, blog comments, the number of visits to the site, the number of pages viewed while on the site, social post interactions, and the list goes on. These attributes will often help you prioritize one lead over another, all other things being equal. One important piece of data to incorporate is the age of the last email touch. It’s safe to assume contacts that are regularly opening and clicking emails from you are more engaged than those who are not doing this. Account for this in your lead scoring by setting up some parameters that represent the amount of time it’s been since the last open or click. A word to the wise: Know that points given for meeting specific criteria can be taken away as soon as the contact no longer meets that criteria. In many circumstances, like for form submissions, this tip won't be relevant. However, if you allocate +3 points to a lead who has visited your website 2-5 times, and you'd like to give them another +3 points if they visit your website 6 or more times, you must assign +6 points to the latter. Why? Because as soon as a lead's "Number of Visits" data value leaves the 2-5 range, they lose the original +3 points they had received for meeting that criteria. The points would not be cumulative. Finally, there’s the elusive offline lead activity that’s much more difficult to track and integrate with your lead scoring efforts. If Marketing or Sales feels like there are underrepresented criteria or holes in your lead scoring process, you may have to manually create properties for these events, and re-upload contacts with that property mapped in a spreadsheet / CSV file. Keep in mind that it’s worth noting an interaction at your booth during an important trade show, or any other touch your marketing or sales team has with a prospect outside of the website’s data-processing wingspan. Step #2: Support your baseline criteria with qualitative research. 1. Have an in-depth conversation with sales. If you haven’t already done so, talk to your sales team about the things that help them quickly assess the quality of a lead. What do they think are their most important website pages, documents, and questions asked on forms? Do they ever say something like “Every time I send prospects this certain piece of collateral, it's a lot easier to close them.” Those are the lead scoring gems that you want to find and add into your process. And on the flip side, which contact properties imply that the contact is not worth pursuing? Those are your negative scoring attributes. Finally, make sure you have a clear picture about who you’re targeting – and how this translates into the data you can collect on your forms. If your forms need to start presenting more specific questions, then create new custom contact properties that you can queue up in smart forms for returning visitors. It’s important to know who you're already raking into the database, but it’s just as important to know who you and your sales team WANT to attract, and then to award more points to contact properties and behaviors that reflect that ideal buyer. 2. Talk to your best customers. Switching gears, one of the most critical things you can do to build an accurate lead scoring system is to talk to a few of your favorite customers who you know will be honest with you. Ask them about what sold them on your business, particularly regarding the website and any content marketing material to which they were exposed. You could also analyze four or five of the most recently closed deals. Who was the point person? Look at that contact’s history in their contact record and check out how they came to arrive at the site, what they downloaded to become a lead, and any other noticeable patterns about their page views, engagement, and form submissions. Looking at the buyer’s journey can help you make decisions about what materials have the greatest impact on lead-to-customer conversion. Digging into your website analytics may also help you out with your lead scoring endeavors – particularly page performance and attribution reports. If there is a certain blog, site page or landing page that is generating a lot of views and conversion assists, you should probably give that page some extra lead scoring love. Is there a Call-to-Action button that’s continually driving people to convert on bottom-of-the-funnel forms? Albeit a small component of your website, it makes sense to add a click of that CTA into your criteria. Step #3: Assign point values to your criteria. It’s also important that when you negatively score your attributes, you subtract a hefty amount of points when a contact indicates they are not interested in your business – like when they opt out of all email communication, or they’ve revealed they’re a competitor. Now here comes the part that can be a little difficult to understand: determining the right HubSpot Score ranges that correlate with identifying a lead as marketing qualified or sales qualified. First, let’s quickly dispel a couple common lead scoring myths. There is no such thing as a maximum score, and if one of your leads somehow managed to accumulate all the possible points and not incur any penalties, there would still be room for that to change. The overall lead scoring range is not 0 to 100, nor is it -100 to 100. You’re not basing your system on being able to accumulate 100 points – again because there is no maximum you can set anyway. Honestly, there is no one correct set value that you should use. Your lead scoring system is all relative to the points you allocate to your various attributes. Combine the properties and actions that best represent an MQL and an SQL. To do this, keep these definitions in mind. MQL = A marketing qualified lead is a lead who is more likely to become a customer compared to other leads based on their demographic information and their activity on your site before they become a customer. SQL = A sales qualified lead is a lead that has somehow indicated they have an intent to purchase. They have likely left the consideration stage, knowing they want and need a solution at least similar to the one your company offers. More importantly, think back to the conversation you had with your sales team about MQLs and SQLs. What would it take for a lead to become an MQL in terms of what you can record and measure in HubSpot? There are going to be multiple scenarios, but take a few of them, and add up the points that correlate with those attributes. Skew towards what you consider to be a minimum set of MQL requirements. Then do the same for SQLs (though don’t be so lenient here). The point total you have for each is your lifecycle stage qualification threshold. It could be that 35-64 points is your MQL score and 65+ points is your SQL score. With that said, it’s important to recognize that the first few months’ worth of MQLs and SQLs will require some attention and extra vetting, primarily to see if your lifecycle stage assignments are accurate. Lead scoring is always a work in progress, and you might need to do some fine-tuning as time goes on. The actual lead score (or HubSpot score) reaching a specific threshold doesn’t have to be the trigger for lifecycle stage assignment. An approach one of our clients (this client happens to have a lot of downloadable content offers available on their site) has found effective is basing lifecycle stage on some basic qualification criteria and a single form submission. If the content downloaded is specific to their target industries—and the lead isn’t disqualified due to a negative contact property value—the lead is considered an MQL. If the contact fills out a form that requires some kind of follow-up from Sales, the lead is considered an SQL. In this case, the lead scoring points are solely used to prioritize one lead over another, helping Sales to determine who they should target with personalized lead nurturing sequences that we’ve created for them. The points are not used to assign the lifecycle stage contact property. Step #4: Input your scoring criteria into the tool. After allocating your point values to your scoring criteria outline, now it’s time to input these values into the HubSpot Lead Scoring tool. Depending on how much information you have, and how much criteria you’ve laid out, this will impact the amount of time you spend doing this. Step #5: Set up lists and workflows. You’re almost done! 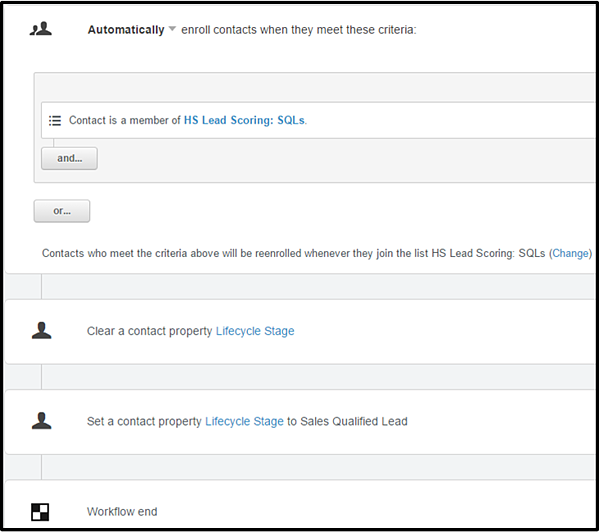 The last step is to create the smart lists and workflows that work harmoniously together to assign a value to your contacts’ “Lifecycle Stage” property in HubSpot. First create a smart list for your marketing qualified leads, and name it something like HubSpot Lead Scoring: MQLs. The two criteria in the list—separated by an AND, not an OR—should specify that the lead has a HubSpot Score greater than or equal to the lower number in your MQL range and a HubSpot Score less than or equal to the number just below your SQL threshold. Your second smart list for HubSpot Lead Scoring: SQLs can just be comprised of contacts with a HubSpot Score greater than or equal to the threshold you’ve set for sales qualified leads. Easy as that! Workflows are specifically used to automate the change in the lifecycle stage contact property. 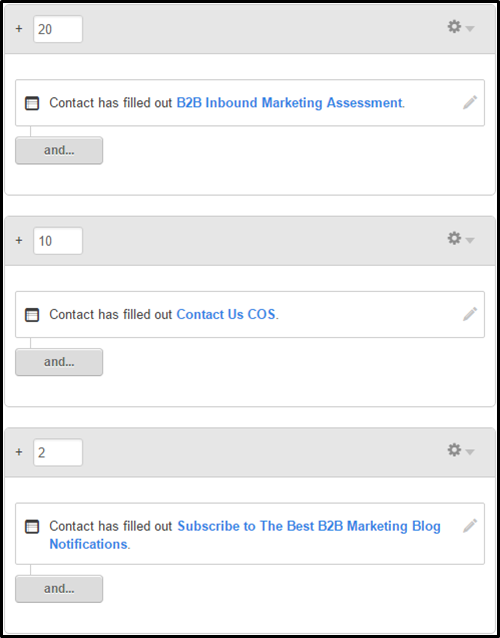 If you aren’t familiar with the Workflows tool, click on the Contacts tab (or Automation tab if you’re using the new HubSpot menu), click on Workflows in the drop-down, click the blue button in the upper-right corner to Create a New Workflow, then choose Standard Workflow – and you’ll arrive on the screen where you can create one. Begin by setting the enrollment criteria based on List Membership. 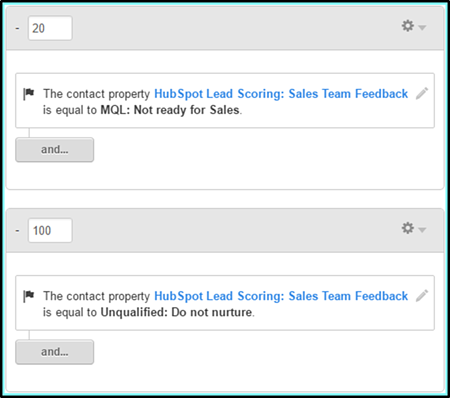 Select your new HubSpot Lead Scoring: MQLs list. Then you can choose to enroll all current contacts that currently meet the enrollment criteria. Allow for the re-enrolling of contacts by clicking on the checkbox below. That way, if an SQL drops down to an MQL in point value for whatever reason, the contact will automatically re-enroll when they rejoin the list. Add an Action to your workflow and select to CLEAR the "Lifecycle Stage" contact property. 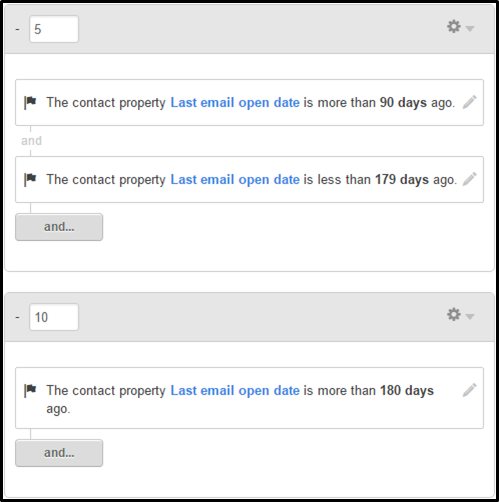 Next, Add an Action again – this time to SET the same contact property’s value to Marketing Qualified Lead. Then the workflow ends. So simple, right?! 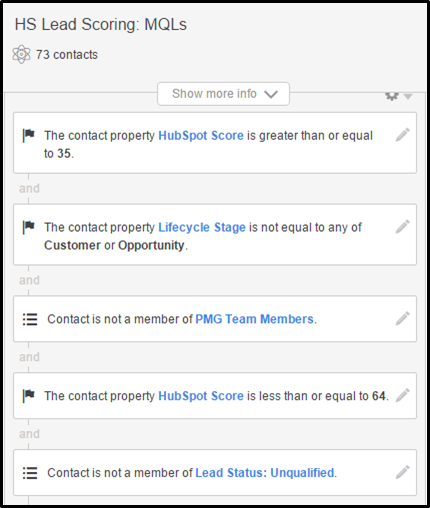 Note: The reason you need to clear the contact property before setting it is because HubSpot will not allow you to go backwards in terms of lifecycle stages unless you manually make the change in the contact record yourself or you automate it in a workflow like so. Test contacts against your lead scoring criteria. If you want to evaluate the system you've implemented, you can test it against a known lead in your HubSpot database. To do this, click the Test Contact button at the top right-hand side (next to the Save button). From the subsequent pop-up, you can search for a contact and select them, and then press Test. You’ll see their score, supplemented by a breakdown of where your contact does and does not meet the requirements of your lead scoring rules. Unfortunately, you do have to scroll through your criteria to see these results. Well-timed follow-up with SQLs is critical. Ensure that Sales is receiving real-time notifications when somebody becomes a sales qualified lead. This can be set up using a HubSpot workflow, too. If your sales team receives the notification instantly, they can immediately follow up (or at least follow up as soon as possible), and try to catch the lead while it’s hot. A fast response time has become increasingly important in this competitive business world we live in, and it’s best to talk to someone when the problem they’re experiencing is fresh in their mind. Keep your lists as clean as possible by adding exceptions to the rules. In both your MQL and SQL HubSpot Lead Scoring lists, it’s important that you ensure contacts tagged as Opportunities and Customers cannot join them. There is a possibility that these contacts could lose lead scoring points and drop into MQL range, thus triggering the workflow to reset their lifecycle stage property. You might also include contacts who have opted out of all email, as well as your company employees and partners, as exceptions to these lead scoring lists, too. Create an SQL feedback loop for Sales. To support your efforts to align Marketing with Sales, it’s a good idea to create a custom contact property they can fill out after they’ve had one or two touches with an SQL that’s been handed off to them. What I’ve done for PMG is to create a property called "HubSpot Lead Scoring: Sales Team Feedback" – and provided three options: True SQL: Ready for sales, MQL: Not ready for Sales, and Unqualified: Do not nurture. If our sales team indicates it’s still an MQL that requires more time and nurturing, they will lose enough points in the lead scoring tool to relegate them to re-enroll in the MQL workflow. Ultimately, they will have to gain back points by continuing to engage with us in order to become an official SQL again, thereby re-enrolling in the SQL workflow and triggering a second Sales notification. If Sales indicates that the lead is unqualified—it could be a competitor, it could be a vendor, it could be a CRAZY person—then they lose 100 points and they're filtered into a Subscriber (the default lifecycle stage) workflow we've set up and held there indefinitely until we manually pull them from the criteria that is keeping them there, or delete them out of the database. Update your lead scoring after publishing new content offers. Remember, your lead scoring criteria requires periodic manual updates. As you publish new gated content, website pages, form questions, etc. that should be influencing your lead scoring, insert them into your criteria with a corresponding point value. This is a common oversight, so just leave yourself a little note to check for recent updates when you have your meetings with Sales. It’s important to acknowledge that lead scoring should be continually refined and honed over time. On a regular basis, monitor how it’s working, and ask for feedback from Sales to find out if it’s delivering the right kinds of leads to them. Do not simply “set it and forget it” – that approach won’t work. The goal is to make lead scoring a legitimately useful tool for Sales and Marketing so that both teams are empowered to reach their goals and report on their achievements. Have any lead scoring tips of your own? Different techniques that have brought you success in the past? Let us know in the comments below. We'd love to get your take on lead scoring!